Discounts apply for larger quantities, Contact Us for pricing. Package includes Aluminium carry case, UK/US/EU Mains power plug-pack, D9 Serial Cable, USB A-B cable, Software for PC, N-type adaptor for probe, Spring loaded ground pin adaptor for probe, Calibration certificate, 12 month warranty. Package includes Aluminium carry case, UK/US/EU Mains power plug-pack, D9 Serial Cord, USB A-B cable, Software for PC, 6 piece male and female N-type calibration kit, Calibration certificate, 12 month warranty. The N adaptor suits the TE1000 and TE3000 active probe head and is used to connect to a standard N type female connector. 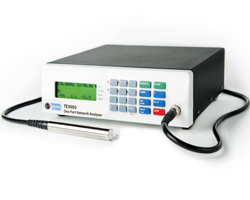 This adaptor suits the TE1000 and TE3000 active probe head facilitating an 'oscilloscope' style probe measurement by providing a flexible path to ground. Adapts from 50R Male N type to 50R Female BNC. Adapts from 50R Male N type to 50R Male BNC. Adapts from 50R Female N type to 50R male N type. Adapts from 50R Male N type to 50R female N type. The detachable passive probe head facilitates oscilloscope style probe measurements. Supplied with earthing spring and TM5176 Calibration kit. Best used with TM5202 test cable. 1m long High Precision flexible Test Cable. N type male to male. Supplied with test report. Power pack for the entire TEXXXX series. 15V, 2A, 2.1mm DC plug. Includes 1 x mains adaptor to the country of choice. Male N type calibration kit supplied in case with foam insert. Contains calibration standards SHORT, OPEN and precision 50R LOAD. Female N type calibration kit supplied in case with foam insert. Contains calibration standards SHORT, OPEN and precision 50R LOAD. Surface Mount Device calibration kit supplied in case with foam insert. Suitable for tweezer attachment. Contains 0805 SMD calibration standards SHORT, OPEN and LOAD. Bare probe calibration kit. Suitable for active and passive bare probe calibration. Contains gold plated steel wool SHORT in rubber desktop holder and precision 50R LOAD. PCB calibration kit. 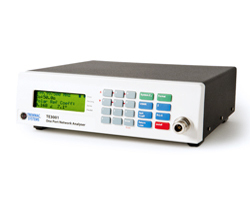 Suitable for active and passive probe calibration. Contains SHORT, OPEN and 50R LOAD calibration standards mounted on 1.6mm FR4 PCB.